Defining of machining conditions is defined in operation parameters window on <Feeds/Speeds> page. Present days NC-controls can to support various assignments of machining conditions, but many of them is using following algorithm. At the same time many parameters is exists and they defines specific machining conditions. Definite power characteristics (frequency, current strength, generator operating regime, etc), wire feed speed and wire offset can be assigned in subject to height and material of workpiece, diameter and material of wire and surface roughness. Usually equipment producers puts in NC-controls already defined table of process parameters or gives means to infill this table. Every set of parameters is named by definite code. Then in corresponding registers easily puts this codes when G-code is builds. 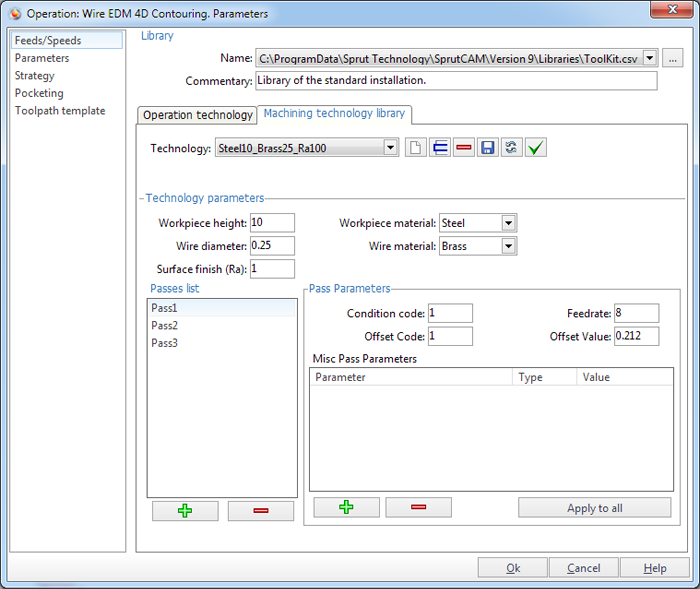 NC-control compares codes with specific process parameters automatically. 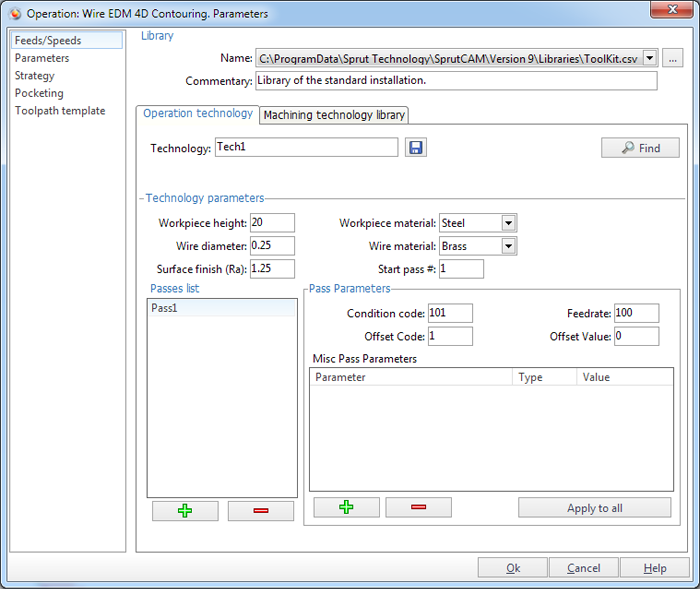 An specific for every machine information about machining conditions can be filled and saved in special cutting parameters library. It is saved in single *.csv file. The current library file is shown on <Name> field in <Library> panel. From the list of this field can be selected one of the libraries from standard libraries folder of SprutCAM. The library can be assigned also from another place with help of standard file-dialogue window, that activated by the button. In <Commentary> field is shown additional text information about selected library. <Technology> – unique text identifier of process technology. <Workpiece height> – height of processed workpiece. <Wire diameter> – diameter of wire for selected technology. <Surface finish (Ra)> – roughness of surface, that will be provided by the selected technology. <Workpiece material> – material of workpiece, for which selected technology is assigned. <Wire material> – material of wire, whereby machining is does. <Pass Parameters> – list of passes with process parameters for every pass. The <Pass> term is one pass, that wire is does along the contour and following list of parameters is assigned for. <Pass name> – text description of the pass. <Condition code> – is a value, that is specific for every machine and it is corresponding to number of register in NC-control. Its code defines process conditions. Usually registers <C>, <E>, <S> is used. For more information about the codes of process conditions see manual of used machine. <Offset Code> – is a number of wire offset register (number of compensation radius). For more information see manual of used machine. <Offset Value> – is a wire offset value for selected offset code. The value takes into account wire radius, overburning value and special stock for every pass. The value is send to postprocessor and can be used for initialization of registers, which is responsible for wire offset. Usually this registers is <H> and <D>. The offset value is used for compensation modeling with general stock jointly. <Feedrate> – is a rate of wire feeding. The value is measured in mm per minute or inch per minute subject to system settings. Many of wire EDM machines is not use feedrate, but the value is available if its will be needed for specific NC-control. This value is used also by system for cutting time calculation. <Misc Pass Parameters> – is an array of additional parameters of the pass. Every parameter is presented by line like <Parameter> – <Type> – <Value>. There <Parameter> is text description of it. <Type> is a type of parameter, it can to be <Integer> or <Float>. <Value> is a numerical value of the parameter. This parameters array and other parameters of the pass is sent to the postprocessor with <PPFUN WEDMConditions(56)> command and can be used for specific purposes in each specific case. <New technology> – adds new technology to the list. <Rename technology> – renames active process technology. <Remove technology> – deletes active technology from the list. <Save library> – saves all changes to a library file. <Reload library> – loads information from a library file anew. All changes in technologies will be lost. <Select technology> – copies active technology parameters from the library to the operation technology. <Add pass> – adds new pass to the list. <Delete pass> – removes selected pass from the list. <Add parameter> – adds a new line to the table of additional parameters of selected pass. <Remove parameter> – removes active line from additional parameters table. – copies additional parameters table of selected pass to all passes of active technology. 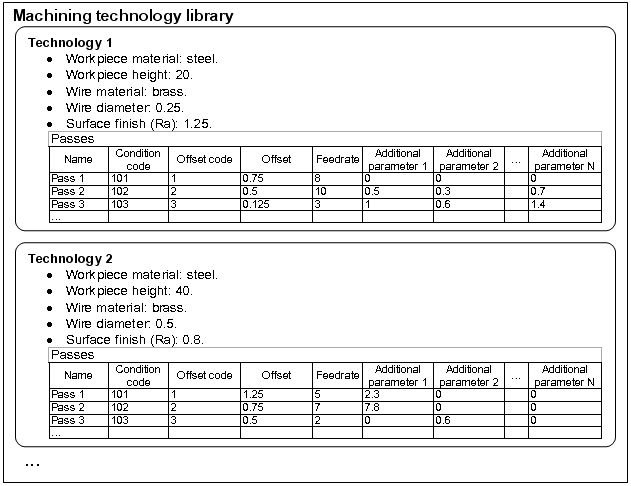 Each wire EDM operation has its own process technology, that contains the same set of properties as a technology from machining technology library. When operation is calculating, it is follow technology from its parameters, but not from the library. Therefore, in order to apply active technology from the library, there is need to copy its parameters to the operation by pressing <Select technology> button. Properties of operation is shown on the <Operation technology> tab. They can to be edited even if the library is an empty. Library can be filled from this tab also by pressing <Save to library> button. If there is filled library of processing conditions exists, then can be used quick search of machining technology with required parameters. After pressing the button system will analyse fields values from <Operation technology> tab and will look for closest technology in the library by using following algorithm. Among all technologies of library system will select those, that has workpiece material, wire material and diameter the same, as defined. Next, the system will look from founded for a technology, that will guarantee higher and closest surface roughness. At the same time system will take into account, that workpiece height must not to be less from defined and to be the closest. If there proper technology is exists, then system will go on <Machining technology library> tab and will activate this technology. Now need to press <Select technology> button to apply the technology. System will return to the <Operation technology> tab and new parameters can to be edited again to fit specific case of the machining. On this tab is <Start pass #> parameter is exists. It allows to define number of the pass, from which machining will be begin. Default value is 1. However, cases can appears, when necessary to do machining by selected technology, but not from the very outset. For example, this necessity can arise in case of cutting separation of one part section to some operations. In that case in the strategy of first operation the number of passes is defined less then technology has. In the next operation the starting pass is defined different from 1. Closest sequence of passes with its numbers is shown on the <Passes display list> info panel on the <Strategy> tab of operation parameters window.